Internationally acclaimed high-performance brake system design, development and manufacturing company, Alcon Components Ltd, will be attending the IDEX exhibition taking place in Abu Dhabi, 17-21 February 2018. Of particular note, you can see Alcon brake products fitted to 8 different vehicles on display at the show, including vehicles from world-class OEM’s based in UAE, Finland, North America, UK and Turkey. 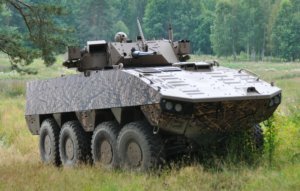 Of particular note are the Patria AMV 8×8 and 6×6 vehicles exhibited at IDEX that both have Alcon brakes fitted as standard. At IDEX, Alcon will have representatives from their sales team in attendance who will be happy to arrange meetings, on request. Alcon has over 25 years of experience in engineering brakes and clutches for specialist vehicles; from F1, World Rally and prestige performance cars to 30T-plus military armoured vehicles. This places them at the forefront of developing and delivering high performance braking solutions for sectors where only the absolute best can be accepted. Alcon’s off the shelf brake upgrade kits allow both OEM’s and vehicle modification companies to overcome the challenges posed by up-armouring vehicles for defence, security and specialist purposes. The kits are compatible with stock OEM actuation, so are easy to fit but have been fully “ruggedised” to ensure extreme levels robustness and performance balanced with the requirement to keep weight to a minimum. If a kit is not available off the shelf, Alcon have a bespoke design service that can deliver a similar offering for any platform of the customer’s choice including vehicles all the way up to 30+ tonne heavy armoured variants. This bespoke engineering offering, from order to production, can provide tailored, performance braking systems to the customers’ exact requirements within an exceedingly short time-frame. Alcon’s discretion, performance and reliability have led to the company becoming the braking system provider of choice for defence, special-forces, security and specialist sector armoured SUV users worldwide. Jonathan Edwards, Sales Director at Alcon said: “it’s fantastic to see so many Alcon-equipped military and security vehicles on display here at IDEX, all benefitting from our extensive experience as a supplier of high-performance, off-road brake systems to World Rally Competition vehicles, civilian armoured vehicles, and numerous global defence vehicle OEM’s.” He added: “as well as the eight vehicles on display at this show, we’re currently working with fifteen other military and armoured vehicle manufacturers who have all turned to Alcon to develop and deliver a bespoke product to meet the demanding, specialist requirements of this sector. We look forward to meeting more interested companies at the event as we expand our global footprint yet further”.